Hey friends! I hope you’ve been enjoying the Christmas season. I have been spending lots of time with my family, so not as much with Southern Plate. I know y’all are busy with family as well and neither one of us would have it any other way! Still, I am looking forward to slowing down and connecting with y’all more once the holidays are over. We just got back from a little trip to one of our favorite places, Disney World. 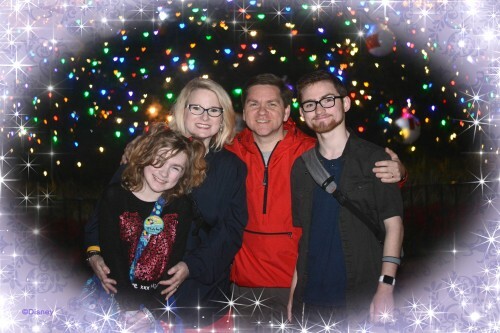 We always enjoy our time together, but seem to find even more magic as a family in one of our favorite places. It’s been very special to us to take our kids throughout the years and this trip was even more special because we’ve been taking Brady since he was 2 years old – and now he is a young man. At 17, Brady is a fine young man and we couldn’t ask for a better kid. At one point, we were having Katy’s photo made with Mickey Mouse and Brady stood up and said “Ahh, for old time’s sake…”, then proceeded to shake Mickey’s hand, give him a hug, and pose for a photo. I instantly felt myself tear up, remembering him as a little boy in a stroller telling me that he just wanted to go see Mickey Mouse rather than ride any rides, and as I looked over and saw Ricky tear up as well, I went full on ugly cry. What a precious gift it has been to get to be his Mama over these years! We are so very blessed and it is so important to open our eyes and be ever mindful of our blessings. Today I’m sharing some of my favorite cookies when I want to make up a treat but am limited on time (and don’t want the mess). There are endless variations and we each have a favorite. Brady loves the chocolate chocolate chip, Katy the red velvet, and Ricky and I are very partial to the strawberry. 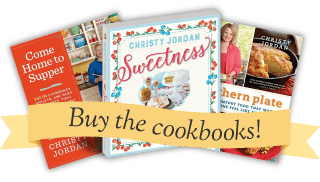 If you came to one of my book signings for my latest book, Sweetness, and had a cookie (or two), it was this recipe. These would be an easy addition to your cookie trays, and yet another blessing to others, this Christmas! Of course, Sweetness would also be a great gift. It’s a book of memories, love, blessings, and recipes written in honor of and dedicated to my grandparents. Click here to see it on Amazon and purchase it for around $10. Combine the cake mix, eggs, and oil in a large mixing bowl and beat with an electric mixer at medium speed until well blended, about 2 minutes. Form the dough into balls a little smaller than a golf ball size and place them 2 inches apart on 2 ungreased baking sheets. Bake until very lightly browned at the edges, 10 to 12 minutes. Allow to cool completely before removing from the baking sheets. 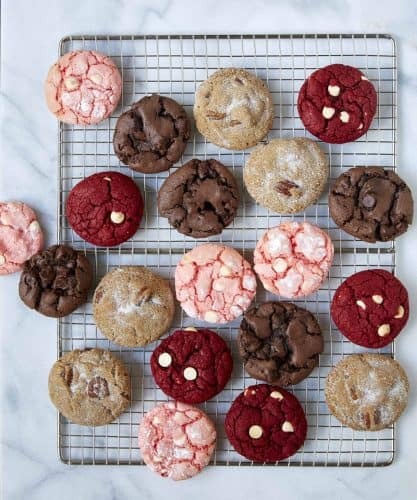 Red Velvet Cookies: Use red velvet cake mix and stir in 1 cup white chocolate morsels after mixing. Chocolate Chippers: Use chocolate cake mix and stir in 1 cup semisweet chocolate morsels after mixing. Strawberry Crinkles: use strawberry cake mix and stir in 1 cup white chocolate morsels after mixing. Roll the dough balls in confectioners' sugar before placing on the baking sheets for a pretty snow-capped crinkle. Butter Pecan Crinkles: Use butter pecan cake mix and stir in 1/2 to 1 cup pecan pieces after mixing. Roll the dough balls in confectioners' sugar before placing them on the baking sheets. i’ve been making these cookies for probably 20 years – they’re so quick and really tasty. but the recipe i got was for 1 stick of melted butter, 1 egg, and 1 box of cake mix, so that’s how i’ve always done it. i might try with two eggs just to see the difference! we usually do a yellow cake mix, with chocolate chips, for a quick cookie everybody likes. …i also want to add that one night i was super tired and forgot to put the egg in, so it was just a stick of melted butter and cake mix, with chocolate chips. and the cookies still turned out ok! not nearly as good, and a lot crumblier, but they weren’t terrible. it wasn’t until they were all already wolfed down that i confessed i’d forgotten the egg. I use chocolate cake mix with white baking chips. After baking and while still warm, I roll the cookies in confectioners sugar. Delicious! Just to let you know I teared up with you after reading this!! That’s so sweet!! I love this quick cookie recipe also!! I’ve done it with a cherry chip cake mix that was yummy too!! (((Hugs))) Christy, he’ll always be your little man, just now in a grown man’s body. Enjoy these times, looking back is bittersweet, but making new memories is nothing but sweetness. This momma thought life just wouldn’t be the same once her boy went off to college. But he came home often and always brought friends with him. We were only 45 minutes from campus so I got to be a little reminder of home for many fine young people during those years. I learned how to make really BIG batches of rice krispie treats (25 cups of cereal at a time, lol, so every guy on the hall could have one). He never moved back home after graduating but he still brings friends back for home cooking and hugs. There are great adventures awaiting you in the grown-up Brady years! He’s gonna make you prouder than you can imagine right now. And you are going to be better than fine because it’s all a part of God’s plan. Have a Merry Christmas and enjoy making those wonderful memories! Wow! I’m not Christy, but thank you for your kind, encouraging words. I needed that! I needed to hear this too. My son is 21 and in college near home so he still loves here, but he will be moving to college before long to finish his degree. Thanks for the encouragement! Will these cookies freeze well? Helenwell – After the cookies completely cool, put them in Ziplock freezer gallon size bags. Place a paper towel between the layers, if you plan to stacking the cookies. This always works well for me. I recently read a tip about how to make cookies rolled in powdered sugar look prettier: First roll the ball of dough in granulated sugar, then roll in powdered sugar. For some reason this helps prevent the dough from absorbing the powdered sugar. I have tried it this year and found it really does work. *sniffle* So sweet! I feel you, my baby girl is 41 and I promise you, it keeps getting better and better! God bless you and yours, this season and the coming years. You have been a blessing to our family for some time now. Thank you for all the memories you helped create and the love and good cheer that goes into each blog. You are part of our extended family, and we all love and appreciate you Christy!! I adore the book, Sweetness, got it on pre-order. My dear husband eyeballs the book and asks, “ooooh, what are you going to make next?” I am thinking, these cake mix cookies! I have enjoyed helping you out this year and hope to continue that next year and the coming years. Thank you Christy for being my friend and for the fun times. Love you! I “ugly” cried too. Your little family is just as blessed to have you as you are to have them. So glad you had a great time and made it home safely. I have lemon and spice cake mixes and want to make me some cookies soon. I loved this post! They don’t stay little for long, do they? Those cookies look so good! Have you tried adding ricotta cheese? A friend makes them and they are delicious. She uses a yellow cake mix, a 16 ounce container of part-skim milk ricotta, 1 egg, 1 tsp of lemon flavoring. Mix, drop by rounded teaspoonfuls, and bake at 350 degrees 10-12 minutes. When they are cooled, she glazes them with a light lemon glaze and tops them with a walnut half. She brought them to a Christmas potluck, and they vanished almost before she opened the box. I got this recipe in the 1980’s somewhere. The recipe was called big fat cookies. I hope you had a Merry Christmas Tracie!! Well Mercy! That sounds about ten steps past brilliant and I’m ready to try it! Love how super easy these are – I used a German Chocolate cake mix, let them cool and frosted them using the tub of coconut pecan frosting. Has now become one of my favorite cookies/dessert. 🙂 I am so glad you liked them!!! Today I tried making spiced walnut cookies out of spice cake mix and walnut pieces. I sprinkled them with sugar and they turned out good. Had a nice gingerbread taste! That is a great idea!! Thank you for sharing Chrissy!! I had a friend who make these cookies using a lemon cake mix a 8oz block of cream cheese and a stick of butter. mixed together, when they cooled she thinned a little raspberry jam and drizzled it on top. Delicious. That sounds wonderful!! Thank you for the idea Pam!